Today’s weather was just about perfect. With a sunny sky, and weather topping out in the high-50’s, it really feels like Fall has made it’s way to the bluegrass. 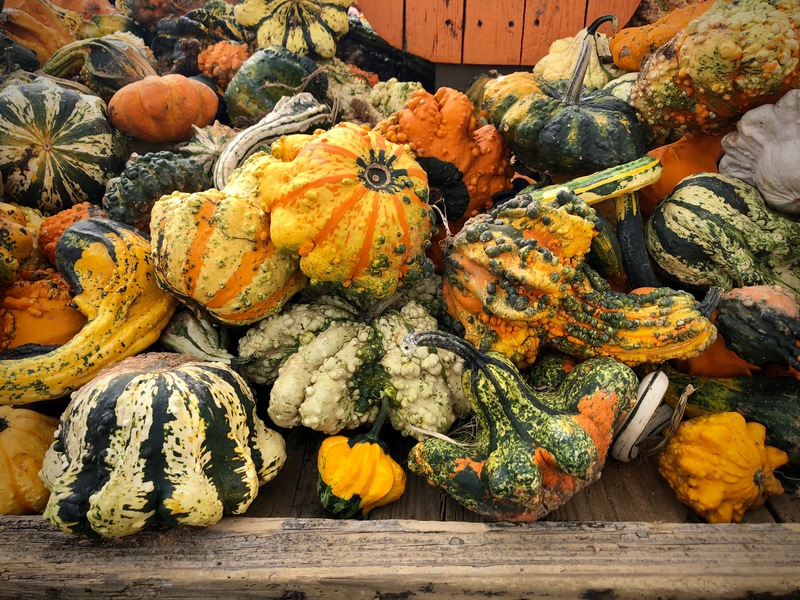 With the man’s momma in town for the week, I decided to take the afternoon off and make the quick trip to Huber’s Orchard for a lunch of fried chicken and fried biscuits, some hot apple cider, bluegrass music on the lawn, and pumpkins… so many pumpkins. Between the wart-covered and funky gourds above, and what seemed like thousands of pie pumpkins in both orange and white, Pam and I filled our cart to the brim, adding in mini pumpkins, giant, decorative green numbers, and big, round pumpkins perfect for carving (because secretly, on the inside, I’m still a child around the holidays). The trip home took us past a roadside stand named The Mum Factory, where potted mums of every size and color were in full bloom. We grabbed a couple each to take home, mer with the idea of decking out the wide steps to our rear patio in fun, fall colors. Finally, I’m in the real spirit of holidays. My fingers are crossed for an absence of any more 80-degree days, and a quick coming-on of changing leaves, butternut squash pies, and perfect, pumpkin-covered entryways.